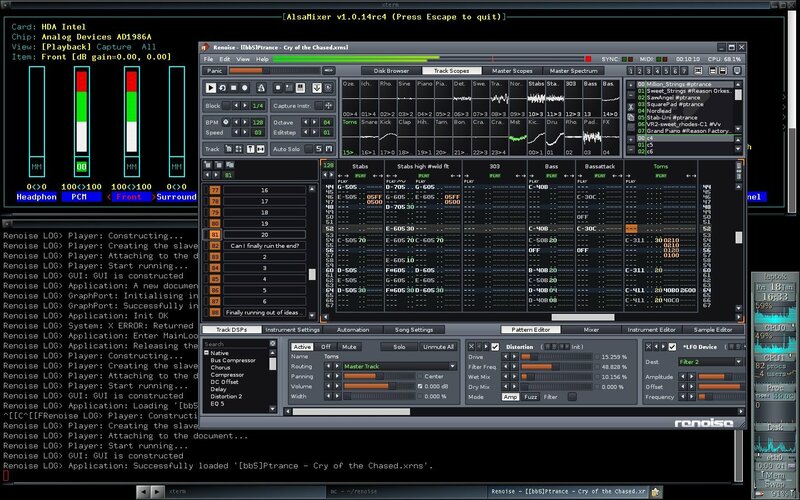 Renoise is a complete music production environment for Windows, Macintosh, and Linux. It features full ReWire support, FX and instrument VST/AU plug-in support, automatic plug-in delay compensation, multi-core load balancing, MIDI I/O, audio recording, flexible audio output, graphical & numerical parameter automation, modular parameter routing, and much more. Renoise is based on mod trackers. Mod trackers are characterized by displaying and editing music in an easily understood grid known as a pattern. These patterns are akin to sheet music, but are displayed alphanumerically instead of with musical notation. Renoise's rock solid stability makes it ideal as a live jamming tool. You can map almost every part of the interface to a MIDI controller, run your guitar through a Line-In Device and distort it with native effects, or just use it as a replacement for an MPC. Instead of spending hours cobbling beats together with a mouse, why not do it in seconds with just a few keystrokes in Renoise? Whether you're an audio veteran or just starting out, Renoise is a fantastic addition to any bedroom or professional studio. Easy to use user interface, all-in-one, customizable and fast (uses DirectX). Easy to use song sequencer and song editor (tracker style). Full MIDI support (MIDI playback synchronized with audio latency and can be additionally synchronized manually if necessary). Full synchronization via MIDI clock as master or slave to external programs or hardware that is able to receive or send MIDI clock (e.g. drum machines, external sequencer, etc.). Integrated support for VST Plug-Ins 2.0 (effects and sound processors). Integrated support for VSTi (VST instruments 2.0 - you can use many great software synths from Renoise). ASIO multi I/O cards support (for very low latency) with the ability to route tracks to hardware channels. Integrated sampler and high quality mixer. Integrated sample editor with full sample editing capabilities (cut, copy, paste, zoom, etc.). Integrated instrument editor with graphical envelopes (better than classic ADSR envelope). High quality player (internal 32-bit float point processing, interpolated, click free). Real-time DSP engine with high quality effects (reverb, echo/delay, compressor, distortion, flanger, phaser, EQ...). Track effects, master effects, send effects which can be applied in desired amount on each track. Unlimited number of effects per track and high speed effects processing. Automation of effects via track and instrument envelopes. Sampler supports: samples, multi sampled samples (sample splits), loop samples (loops). Use sounds all at once: Sampler + VSTi + MIDI audio (as one instrument). High quality WAV renderer (32-bit, 96 kHz, 2 quality modes (near perfect and perfect), with ability to render each track into separate file). Build-in visualization (Stereo Scopes, Track Scopes, Spectrum Analyzer). Many popular formats support (songs/modules/instruments/samples). Renoise's internal instruments have been re-engineered. The focal point is a new keyzone editor that supports overlapping, velocity, and key release mappings. The Sample Keyzones editor brings with it user interface refinements, improved drumkit generation, better tuning options, new sample properties, and loop modes. Live instrumentalists can also tap into new realtime rendering modes and MIDI input routing, making Renoise on a laptop a formidable replacement for your old sampler. New Slice Markers push Renoise's breakbeat insanity one step further. With the click of a button, your break is sliced and keymapped. Amens away! More than just a beatslicer, creatives will soon discover custom offsets and the power of aliases for controlling longer recordings like vocals and soundscapes. The revamped Automation Editor now provides a zoomable overview of the entire song, as well as vastly improved envelope resolution. Navigating is smooth, dragging and drawing easier, so simple yet so useful. Internal FX get an injection of winning with a new Comb Filter and a Multiband Send that lets you surgically redirect a single sound source to 3 send tracks. New draggable gain and frequency handles in the native EQs add flavour and finesse to the tools. Other changes include improvements to DSSI, MIDI optimizations, hardware-compatible solo mode, adjustable audio headroom, pre-count, ameliorations to the Lua API, and numerous other changes in every aspect of the app; no stone was left unturned in this release. Minor usability and functionality refinements galore!